Indonesian law requires resource extraction companies to manage and pay for post-mining reclamation. The law is poorly enforced, and many coal mining sites are abandoned without reclamation or even basic safety precautions. Officials say they lack the resources to tackle the problem effectively. Twenty-five children have died in abandoned mining pits in Indonesia. Under Indonesian law, resource extraction companies are responsible for restoring mining sites after they have finished scraping coal from the earth. Mining companies are legally required to set aside funds to cover reclamation costs, a regulation intended to prevent companies from simply walking away when mines are no longer profitable. Despite these laws, the country’s mining regions are pockmarked by abandoned coal mines – deep pits that have become deathtraps as well as eyesores. Between 2011 and 2015, 25 children lost their lives in the alluringly blue-green water that fills these steep-sided holes. When pressed for answers, one official charged with monitoring compliance with mining laws points to loopholes, economic factors and insufficient manpower. 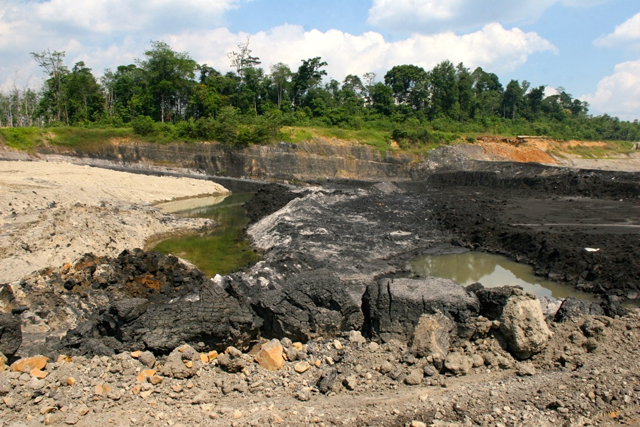 Coal mining pit in Jambi, Sumatra. Photo by Feri Irawan. Novaizal, head of the Ministry of Energy and Mineral Resources’ supervision department in Jambi, Sumatra, says declining coal prices led some companies to default on their responsibility to reclaim their mining sites. He explains that from 2010 to 2013, local producers could count on receiving around $35 per ton. That fell gradually to $18 to $20 per ton. A recent uptick in prices has not been enough to reverse the trend. “The costs of operating were no longer commensurate with the price of coal. This became a problem,” he says. When coal prices plummeted, many companies suspended operations and hundreds completely closed up shop. Coal deposits are found in sloping layers, buried beneath layers of soil and rock known as overburden. If the overburden covering the coal is thin, operating costs are low. If it is thick, costs are higher. Closing up a mine before it has been exhausted greatly increases the costs of extracting coal in the future. 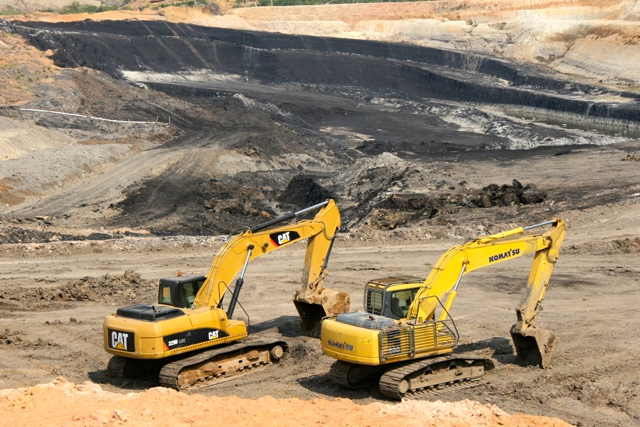 Coal mining operation in Jambi. Photo by Feri Irawan. “The pits are left uncovered. If they were covered, and they want to remove coal again, they have to remove the covering of earth before they can begin digging again, and the operating costs become high,” Novaizal says. Local officials lack the capacity to independently verify claims that a company eventually plans to resume mining a particular pit. “It’s not possible for us to drill just to figure out whether a mine still contains coal or not. We use data from the companies,” he says. Novaizal concedes that supervision by the Ministry of Energy and Mineral Resources in Jambi is not yet optimal. The budget is limited, he says, and the local office of the Ministry is not equipped for intensive monitoring. “Our human resources capacities are limited, only six or seven people, so not all (excavation sites) have been visited. Our budget is also limited due to budget cuts,” he says. However, he feels their efforts have met the required standards for supervision under Indonesia’s 2010 Mineral and Coal Mining Direction and Supervision Law (PP No. 55/2010). “According to the law, monitoring must be done twice a year. We have done this,” he says. During this time, he adds, companies’ Annual Technical and Environment Plans (RKTTL) were approved by the government. These reports, produced by mining company at the end of each year, detail the company’s progress during that year and its work plan for the upcoming year. If there are any discrepancies, monitors from the ministry are supposed to check the company’s work site. 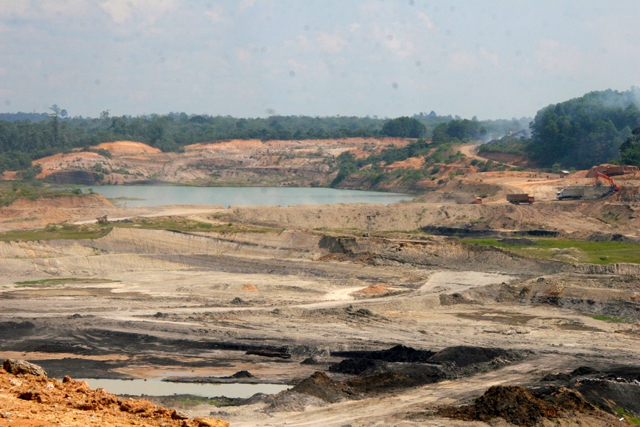 Coal mining area in Sarolangun, Jambi. Photo by Feri Irawan. Feri Irawan, director of the NGO Perkumpulan Hijau (Green Society) is critical of the ministry’s performance. 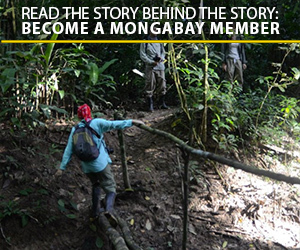 The Ministry and the local government’s Environmental Office (BLHD) should make site visits at least once every three or four months, he contends. This is why there are still abandoned mine pits, says Irawan. These are the classic excuses that allow companies to escape responsibility. Coal mine in Sarolangun operated by PT Jambi Prima Coal. Photo by Feri Irawan. In May, the Environmental Office for the Sarolangun District in Jambi sent warning letters to dozens of coal mining companies operating in the area. These letters related to the reclamation of former coal mining pits that had been left in disorder. Not getting responses, the office sent out a second round of warning letters in July. “The companies are responsible for post-mining reclamation, as stipulated in their environmental impact planning documents,” said Fausi, a Sarolangun district official who became responsible for the district’s Environmental Office. 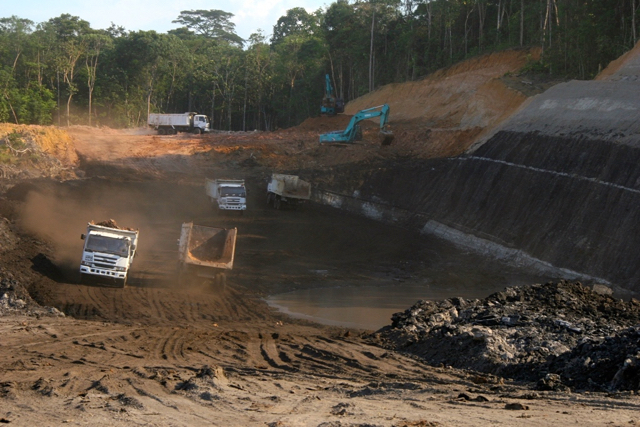 So far, only three companies have submitted reports about the reclamation of mining sites. The Environmental Office gave a deadline of 100 days. “When 100 days have passed and we have not received reports, I will report it to the governor. Because this comes under the governor’s authority,” Fausi says. Yitno Suprapto, “Begini Dalih Perusahaan buat Abai Reklamasi Bekas Tambang Batubara di Jambi” Mongabay-Indonesia, 17 Sept. 2016.